Three Boy Circus: Disney's #MillionDollarArm Coming Soon! Can't get enough of Jon Hamm on Mad Men? Well, you're in luck! He's starring in Disney's Million Dollar Arm coming this May! Based on a true story, sports agent JB Bernstein (Jon Hamm) finds that business has changed and things aren’t going well for his career. In a last ditch effort to save his livelihood he concocts a scheme to find baseball’s next great pitching ace. 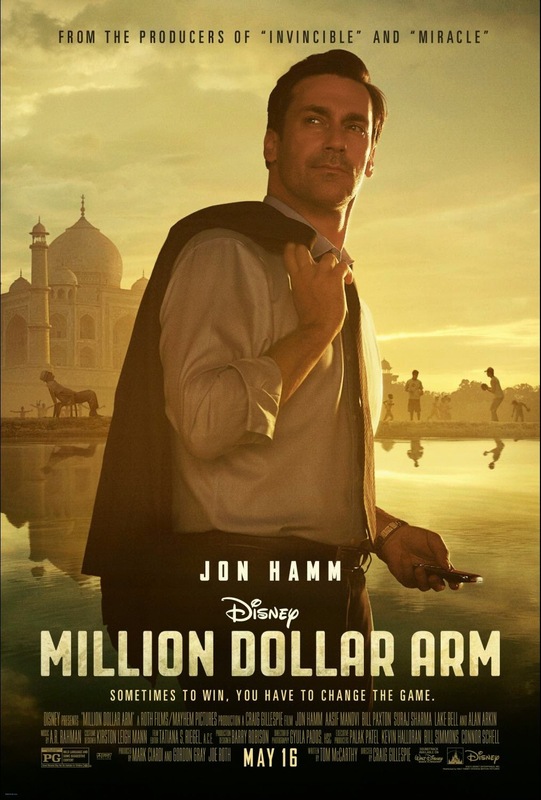 Hoping to find a young cricket pitcher he can turn into a major league baseball star, JB travels to India to produce a reality show competition called "The Million Dollar Arm." With the help of cantankerous but eagle-eyed retired baseball scout Ray Poitevint (Alan Arkin), he discovers Dinesh (played by Madhur Mittal from "Slumdog Millionaire") and Rinku (played by Suraj Sharma from "Life of Pi"), two 18-year-old boys who have no idea about playing baseball, yet have a knack for throwing a fastball. Hoping to sign them to major league contracts and make a quick buck, JB brings the boys home to America to train. While the Americans are definitely out of their element in India, the boys, who have never left their rural villages, are equally challenged when they come to the States. As the boys learn the finer points of baseball, JB, with the help of his charming friend Brenda (Lake Bell), learns valuable life lessons about teamwork, commitment and what it means to be a family. Follow on Facebook or on Twitter for more info. This movie looks great-Coupon Crazy Mommy was here! Yeah it does, and that's saying something because I normally do not like sports movies lol.